Fortunately, there are a couple of tricks and shortcuts to achieve the best result with the least effort, especially if you are busy (ahem, =lazy) like me. Firstly what I love to do is choose my color palette. This consists mainly of 5-6 colors. Three browns, a light, medium and a dark one, as well as a reddish and a greenish pencil. I use the light, medium and dark brown for the highlights, medium tones and shadows respectively. Then I might add a red layer if I would like some warmth to my skin, or I will some green strokes to make the skin less saturated. After all, green is complimentary to red and they tend to “cancel” each other. 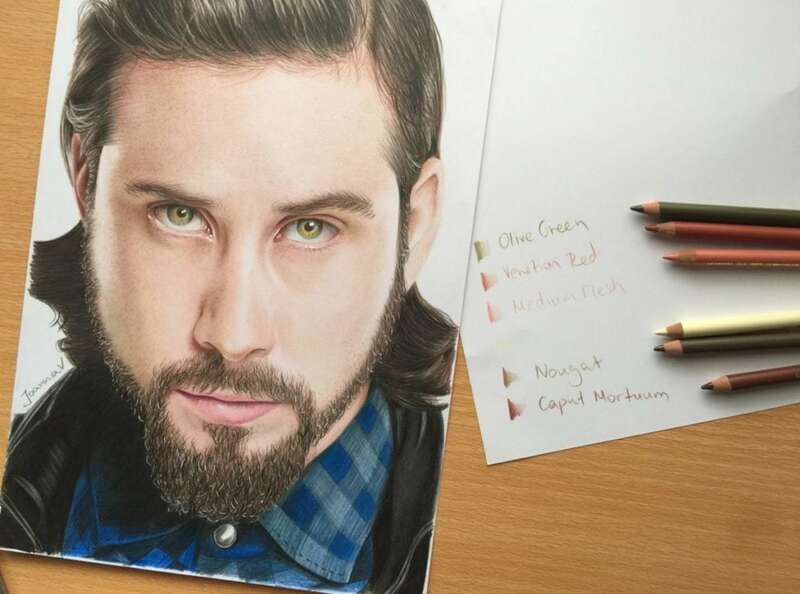 They are all faber-castell polychromos colored pencils. Ivory is very light, it doesn’t show on camera, but it is there! So, basically I used Ivory for highlights, Medium Flesh for mid-tones, and for the shadows I mixed two colors: Nougat and Caput Mortuum. Then I made him blush with Venetian Red on the cheeks, and intensified the shadows on the left part of his face with Olive Green. Also, when defining my palette, I tend to choose either complimentary colors and colors that match one another. This adds depth to my drawing and makes it look less flat or monochromatic. Lastly, there are a couple other tools worth mentioning, for those who would like to take it to the next level. These include an eraser and a white marker. No matter how light-handed one can be, unwanted strokes can always happen when working with colored pencils. 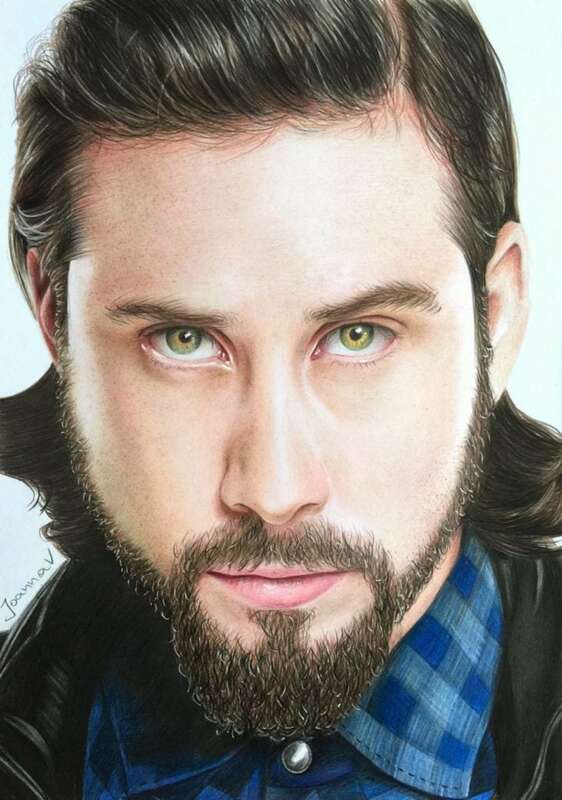 When I need the skin to be extra smooth, like Avi’s here, I like to use an eraser to carefully erase these strokes. I prefer pencil erasers, like tombow mono zero shown here, as they are super thin and can erase very small details without disturbing the surrounding area. Sometimes I use a normal eraser which I sharpen with a knife. Finally, a white marker always comes in handy. Apart from drawing white details, like hairs, reflections etc, I use it sparingly to write over over-worked areas that cannot be erased any other way. The area becomes white and you can recolor it. Just be careful which marker you will choose. I love this white posca marker shown here, as it is super opaque and high quality. So, basically that’s all. Hope you found this post useful and I would love to know your own tips!